Inside your eye you naturally have a lens which helps focus the incoming light creating clear vision. A cataract is a progressive clouding this lens. 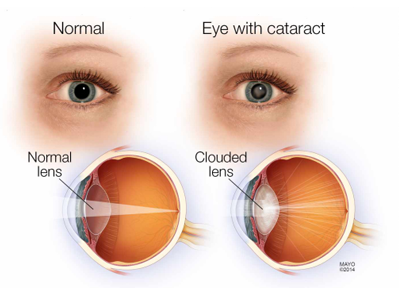 The development of cataracts is usually a very gradual process, however different types of cataracts progress at different rates. Many people are unaware that they have cataracts in the early stages because the changes in their vision are so gradual. Having cataracts is often compared to looking through a foggy window or through the dirty lens of a camera. Because of the clouding a variety of visual changes occur including blurred vision, increased glare (often with oncoming automobile headlights while driving at night) and dulled color vision. Once a cataract has progressed to the point that it is impacting your vision cataract surgery can be completed to restore vision! Our practice partners with Vistar Eye Center to help offer this surgical care as close to home as possible, in fact many of the pre and post surgical visits are able to be completed at our office.